Impossible only if you are afraid to hit the bare metal with assembly programming! Four rotating sprites and a rolling raster bar! And the Source Code, including the Ball Demo part. Open in VS7, compile and upload. Note that the Source Code is just Beta, as I am working on the final sound system. I will explain this entire thing line by line once it is ready. Sorry about the crude sound, I was just testing the Voice Mixer. Sound is just the position of X and Y into 2 of the 4 channels for this demo. I will be adding music playing ability very soon. Did I mention that an Tiny85 has only 512 BYTES of RAM?? That's less bytes than the graphic for your mouse pointer! This is just the beginning, I promise. Much more graphical insanity to follow. Fully commented source will be posted here as a detailed tutorial for this project soon. AVR + Assembly = Untouchable! Have you tried porting to newer AVRs, maybe something like ATTINY817-XMINI the low cost Eval Module. Interesting, those new parts look more line pin reduces ATMega 328's than Tinys. I wonder why they put them in the Tiny family? Size alone? Doing the VGA demo on the Tiny85 was extra challenging due to the lack of a multiplier. I think this was part of the draw to try. For me, the next AVR I like to see is would be an 8 pin XMega. I might check out the new offerings one day though, and see what they will take. 3V XMegas are also not so active, as the Cortex M0s instead cover the 3V supply space. New Cortex parts worth a look also in SO14 are the ATSAMD series, in 8K and 16KF, with 4K RAM, 48MHz would not need overclocking ? That demo is beyond awesome!! Let's see some compiler try to match that! megaAVR 0-series are somewhat like XMEGA AVR D-series except 5V and 20MHz. A future product is tiny412 in SOIC150. Suggest this thread be saved as a demo of the correct way to wire a breadboard! Xmegas can be overclocked very easily. Just alter the PLL multiplication value. In my experience they run fine. Brad has overclocked regular Mega AVRs successfully. I would expect most AVRs to work outside the official spec. However, you would be unwise to do this in a commercial product. Especially since there are plenty of Silicon Manufacturers that have faster (and cheaper) chips than Microchip/Atmel. Would a base resistor on the NPN effect your audio output? It is an emitter follower. No need for a base resistor. But a small resistor would do little harm. Just reduce the output swing slightly. 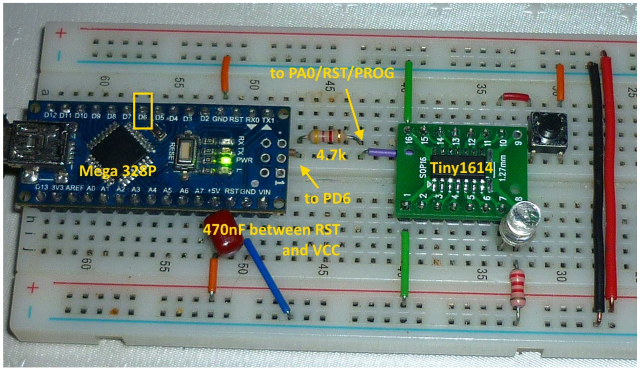 tiny1614 has 2KB of SRAM; next up in SRAM is mega4809 at 6KB. possibly two clock domains (external pixel clock, internal 20MHz RC) though over-clock is cool! I'd make the 40MHz wire between the osc & pin2 as direct as possible...looks a bit zig-zag (or maybe I'm not seeing it properly)...does that affect performance? I'd place all the video sigs right next to the chip & make the audio stuff the one further away. Might not make a beancan worth of viewing difference...might help you pass radiated emissions! Every adjustment can be another tweak toward more awesomeness. As being more similar spec/vcc to the 20MHz AVRs than the XMegas, 40MHz would be more expected - but newer parts may have less margin than older parts.